Home / GOVERNANCE* / Accountability, What Does Mid-Term Scorecard Show? Accountability, What Does Mid-Term Scorecard Show? Come June 9, 2017 all the members of the 8th National Assembly will be expected to render a mid term account of their stewardship to their constituents, while their counterparts in the states will also be letting their constituents into the know, of what they have done with the opportunity given to them to be their representative. In Abia, having been bedevilled with eighteen years of poor representation across the red and green chambers, the people have resorted to fate as they have lost confidence in their representatives in both the state and National Assembly. Most people do not know who their representatives are, or where his/her constituency office if any, is located, because of the absence of an effective communication channel between them and those who have been sent to represent them. 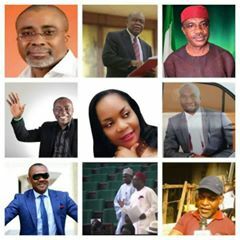 On the 9th of June 2017 Senator Enyinnaya Abaribe will be marking 6 years as the Senator representing Abia south, while senators T. A Orji and MAO Ohuabunwa will be completing their two years in the red chambers. In the house of Representatives Hon. Nnenna Elendu Ukeje and Nkeiruka Onyejeocha will be hitting their tenth year each as representatives of the Bende and isuikwuato/umunneochi federal constituencies respectively, while the other house of representative members include Hon. Solomon Adaelu (Obingwa, Ugwunagbo and Osisioma Federal Constituency), Hon. Uzoma Abonta (Ukwa West/East Federal Constituency ), Hon. Darlington Nwokocha (Isiala Ngwa North/South Federal Constituency), Hon. Uko Nkole (Arochukwu/Ohafia Federal Constituency), Chief Sam Onuigbo (Ikwuano/Umuahia federal constituency), Hon. Ossy Prestige (Aba North/south federal constituency) are all green horns in the green chambers with just two years experience in law making and representation. It has become very evident that majority of those we sent out to represent us have failed, given their midterm score card. But in the midst of this unconscionable representation and leadership irresponsibility, Honourable Solomon Adaelu and Ossy prestige had shown quality,robust,effectual and efficient representation in both the core mandate of law making and social responsibility to their constituents. While Honourable Solomon Adaelu had raised the bar in representation through the procurement of construction equipments such as caterpillars and graders to keep the roads within the three local governments he represents motorable, all year round, his educational endowment/empowerment program has exposed his love for his constituents and the desire and hunger for the development of ugwunagbo/osisioma/obingwa federal constituency which he sits as their representative. Education being the best any leader with genuine love for his people can give, and Honourable Adaelu having recognised that, has gone ahead to ensure that every child especially the indigent ones within his constituency is entitled to primary, secondary and tertiary education by giving out scholarships and purchasing of jamb forms for his constituents. He has also introduced a training program for those categorized as unemployable within his constituency, this program will afford them the opportunity of being trained in their chosen vocation, so as to ensure that they end up as responsible citizens rather than motor park touts and political thugs, all these are outside of his regular empowerment programs for his constituents. Hon Adaelu has also made provision for a periodic interface with his constituents alongside a free medical aid program to take care of those who cannot afford basic health care services. In the area of his core mandate of law making, Honourable Solomon Adaelu who has been rated as the 2nd most vocal lawmaker from Abia, after Senator Abaribe by political analysts, has sponsored bills and raised motions much more than any other representative from Abia state in both the green and red chambers put together within the representative period in focus. The same can be said of Hon. Ossy Prestige interms of the provision of democratic derivables that comes through representation, the member representing Aba North/South in the house of representatives, Hon. Prestige has attracted and asphalted roads within his constituency, drilled boreholes, provided free school buses for students, built classroom blocks for schools, graded roads across Aba, and had provided free legal and medical aids for his constituents. One may be tempted to say that these two youthful and performance hungry lawmakers with vision, mission and passion for excellence had excelled where the state government and their other colleagues in both the green and red chambers has failed, and all these they did within two years of their being elected to represent their individual constituencies. In as much the achievement of the Abia State house of assembly in the last two years has been a world record impeachment and change of 3 speakers within 24 hours, I am also aware that some house of assembly members have also performed creditably, given the prevailing politically frustrating environment and economic situation available within the Abia political space. Please don't ask me what the senators had done with the mandate and constituency development funds allocated to them because I don't know and cannot say what I can't readily defend if called upon. But I will only advise the youths and the electorates to hold your representatives accountable by demanding for periodic account of their stewardship since they were elected into the different representative chambers at different levels. Let's start from their midterm scorecard, let those who haven't performed let us into their constraints and challenges, let them also let us know if they are being owed their constitutionally provided constituency development project funds, so that we will collectively March down to the national and state assembly and demand for it.